The final part of our trilogy, showing some juice recipes that can keep you healthier during the cold winter months. Are you brave enough to try juices with cabbage, horseradish, and more onions? They're not as bad as they sound, when mixed with other ingredients. Horseradish certainly isn't something you normally associate with juice. But it has been used for generations against colds and coughs. That is because it contains a mild natural antibiotic. In addition, it has properties that break up mucous, which help to reduce annoying coughs. It has a strong taste, but fortunately only a little bit is needed to be effective, as you will see in our first recipe. We've already written about onions and their health benefits a few times. That's because onions have powerful sulfuric compounds- the substances that make you cry when chopping them. These compounds detoxify the system, especially the liver. 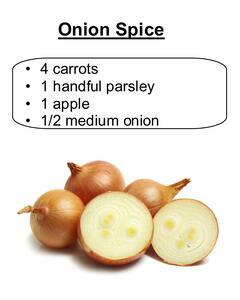 In addition, onions are the best natural source for quercitin, a natural antibiotic. Onions are the feature of our second recipe. Our third recipe features an ingredient many people really hate in juice form: cabbage. It's too bad, since cabbage juice is quickly gaining status as a true superstar in healing. With high levels of vitamins and minerals, especially free-radical fighting vitamins C and K, it is a great foundation against infections. In addition, it contains the "beauty minerals" silicon and sulfur, which can flush out toxins in skin cells. Finally, it is useful for weght loss as it can cleanse the intestines, making digestion more efficient. 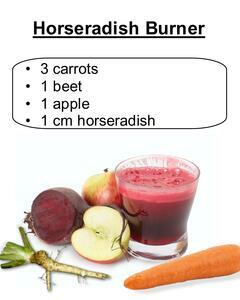 Horseradish juice is a well-known germ killer that is not only effective for colds but for any viral infection. Adding the healthy trio of beets, carrots, and apples turns it into a nutritional powerhouse. WARNING: Both beets and horseradish are have strong cleansing properties, and should be started gradually. If you're sensitive, start with half the amount of beets and horseradish. We already mentioned a recipe with onions in Part I of this series. That one was apple-based, while this cuts the onion pungency with carrots. The parsley adds a it of spiciness that distracts a bit from the onion as well. Remember, just like with beets and horseradish, onion juice is powerful medicine. A little goes a long way so don't juice more than half an onion. During the winter in cold countries, it can be difficult to find fresh local sources of vitamin C. That is where cabbage comes to the rescue. It grows under harsh conditions, and is surprisingly high in vitamin C and K. With its antiviral and antoibiotic properties, it packs a strong nutritional punch. 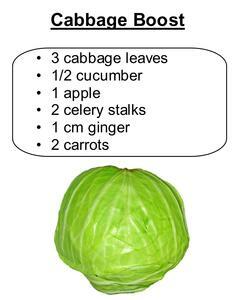 And according to studies, consuming cabbage juice three times a month reduces your risk of bladder cancer by 40%. Note: Cabbage will make a squeaking sound when juiced in slow juicers. Don't worry. It is normal and just a characteristic of fresh cabbage. Remember to check out part I and part II of our series of juice recipes to help keep you healthy this winter. Part I had some rather "extreme" ingredients, but part II kept things more mild with juices even your kids would like. 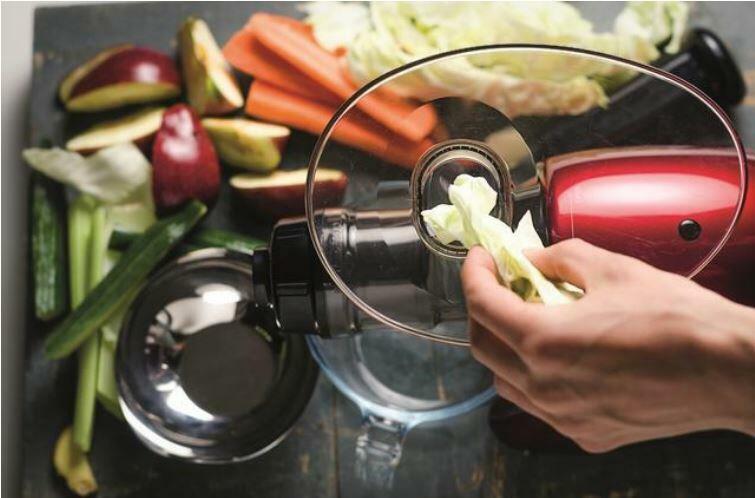 We recommend a horizontal cold-press juicer to handle these more exotic ingredients. They are the most versatile type of jucier, able to handle any type of fruit or vegetable with good results. Just remember the one rule: for the best results, always use the freshest ingredients.